Novi Sad, January 16-20th – Over 60 citizens took part in the on line action “I Address the MP”, conducted by the Serbia on the Move’s team from Novi Sad that is engaged in the initiative “I Choose Whom I Choose”. 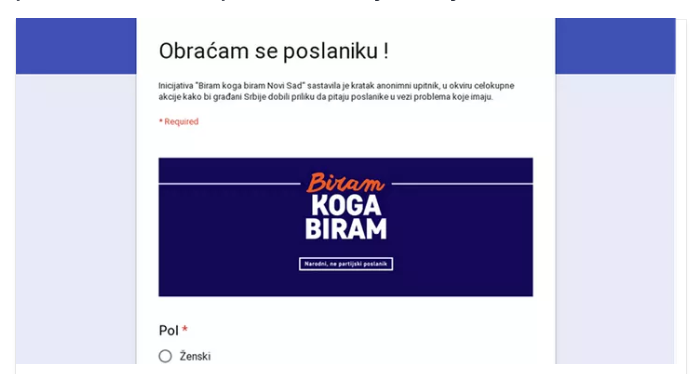 The action had its first part in December and now it continued via Facebook – the citizens of Novi Sad, but from other Serbian cities as well, had the opportunity to fill the questionnaire about the problems in their local communities. They were also able to ask the MPs in charge the questions regarding these problems. Besides the unemployment, the biggest problems in most of the cities where the activists talked to the citizens, the biggest concern of Novi Sad residents has to do with unenviable situation in health system that often forces them to turn to the private practice, since the waiting lists in the public practice are too long. The education system was also mentioned, the citizens questioning teachers’ competence. 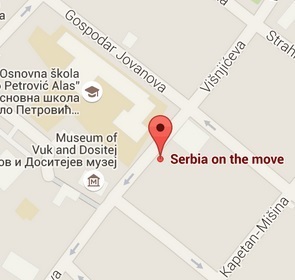 As in other Serbian cities, corruption reached top five problems in Novi Sad as well. “I believe this poll brought us closer to solving the problems stated. Our fellow citizens were very concrete in answering our questions,” Nataša Ćirić, the activist of the team from Novi Sad shared her impressions with us. All of the teams that participate in the initiative “I Choose Whom I Choose” will organize synchronized actions at the beginning of February. The purpose of these actions will be to single out the most important problems out of the numerous ones they have collected.